Simultaneous monitoring of surface winds and currents is essential to understand oceanic responses to tropical cyclones. We used a new platform, a Wave Glider (Liquid Robotics) to observe air-sea processes during a typhoon, equivalent to a category 4-hurricane, at peak strength, near Okinawa, Japan. Surface winds showed strong asymmetry in both speed and direction, faster fore than aft. Rotations of surface winds and currents were not coupled; currents rotated clockwise in the wake of the typhoon eye after passage of rapid wind rotations. Wind work was mostly done ahead of the eye, amplifying prior inertial motions with a phase shift. Wind-induced energy was nearly balanced with an increase in estimated kinetic energy of the upper ocean current, relative to prior inertial oscillations. This study provides a newer, more complete view of actual atmosphere-ocean interactions in a typhoon. Figure 1. The Wave Glider made a close approach to the center of Typhoon Danas and documented rightward clockwise oscillatory motions afterward. (a) Hourly locations of the glider (yellow dots) and the interpolated trajectory of the typhoon center (white line with red symbols; obtained from the Regional Specialized Meteorological Center, Tokyo) are plotted. 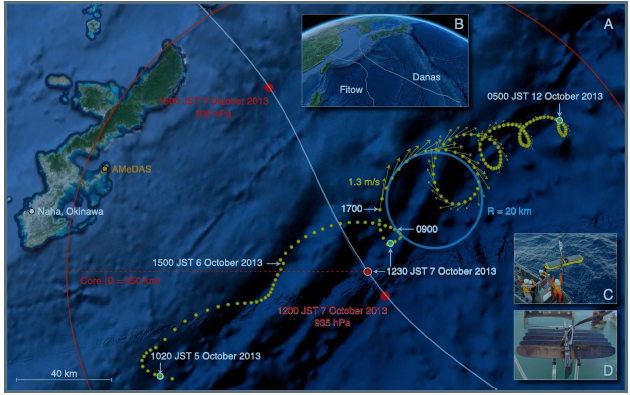 The red line indicates the outer boundary of the estimated typhoon core (the area with 10 min sustained winds of 15 m/s or faster) at 1230 JST 7 October 2013 when the glider was closest to the typhoon center. Surface velocities (yellow arrows) are shown after 1700 JST 7 October during the rotations. (b) Tracks of Typhoons Fitow and Danas are shown. (c) The glider was retrieved at 0500 JST 12 October 2013. Thesurface float was intact. (d) The underwater wings had become entangled in the umbilical cable while the Wave Glider was beneath the typhoon center,after which the glider rotated with the current. The elucidation of species diversity and connectivity is essential for conserving coral reef communities and for understanding the characteristics of coral populations. 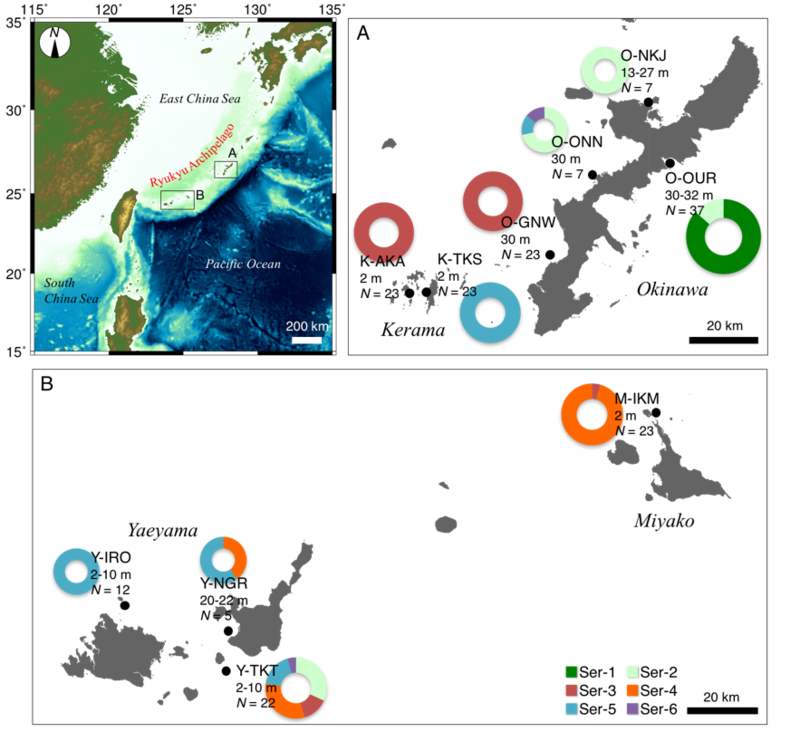 To assess the species diversity, intraspecific genetic diversity, and genetic differentiation among populations of the brooding coral Seriatoporaspp., we conducted phylogenetic and population genetic analyses using a mitochondrial DNA control region and microsatellites at ten sites in the Ryukyu Archipelago, Japan. At least three genetic lineages of Seriatopora(Seriatopora-A, -B, and -C) were detected in our specimens. We collected colonies morphologically similar to Seriatopora hystrix, but these may have included multiple, genetically distinct species. Although sexual reproduction maintains the populations of all the genetic lineages, Seriatopora-A and Seriatopora-C had lower genetic diversity than Seriatopora-B. We detected significant genetic differentiation in Seriatopora-B among the three populations as follows: pairwise FST= 0.064–0.116 (all P= 0.001), pairwise G’’ST= 0.107–0.209 (all P= 0.001). Additionally, only one migrant from an unsampled population was genetically identified within Seriatopora-B. Because the peak of the settlement of Seriatoporalarvae is within 1 d and almost all larvae are settled within 5 d of spawning, our observations may be related to low dispersal ability. Populations of Seriatoporain the Ryukyu Archipelago will probably not recover unless there is substantial new recruitment from distant populations. Figure 1: Map of the sampling sites, depths, numbers of samples, and number of haplotypes of the mitochondrial control region (mtCR) of Seriatoporain the Ryukyu Archipelago. Temperature is an important factor affecting the distributions and life-history traits of marine animals. Deep-sea hydrothermal vents are suitable environments to examine ecologic differences related to temperature, due to the steep temperature gradients around the vents. Rearing experiments under various temperature conditions (5–30 °C) at atmospheric pressure demonstrated a difference in thermal effects on egg hatching and larva in two co-occurring, vent-associated alvinocaridid shrimps – the peripherally distributed Alvinocaris longirostris and the centrally distributed Shinkaicaris leurokolos. The duration before hatching became shorter as temperature increased, while the maximum hatching rate occurred at higher temperatures in S. leurokolos (10–20 °C) than in A. longirostris (10 °C). Hatched larvae of both species were negatively buoyant, and larva with normal abdominal length could actively swim and stay suspended in the mid- or surface water layers of the culture plates under our experimental conditions. However, no larvae settled or metamorphosed into juveniles under the rearing conditions used in this study. Larvae with shortened abdomens occurred under most of the experimental conditions, although they were less frequent at 10 °C in A. longirostris and 20 °C in S. leurokolos. The maximum survival periods at these temperatures were 88 days in A. longirostris and 30 days in S. leurokolos. These characteristics may cause differences in the distributional ranges of the two species. 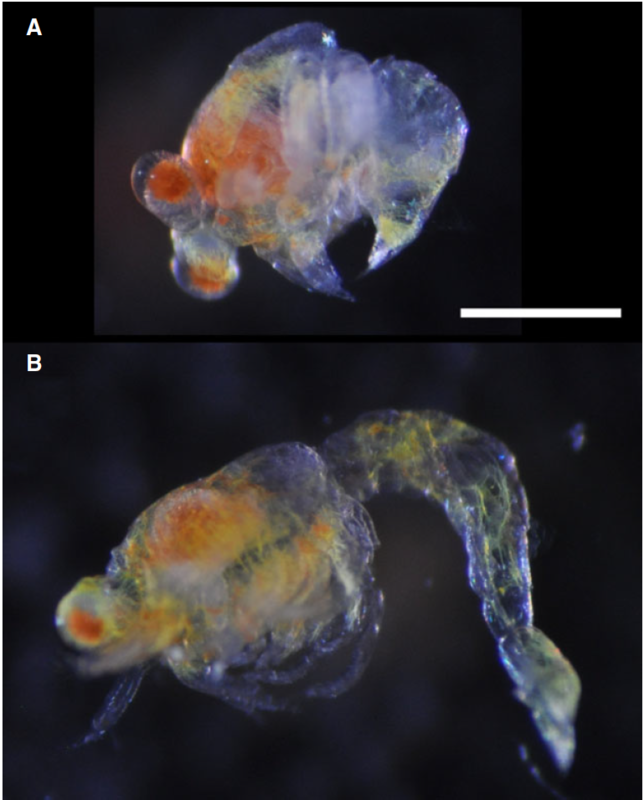 The present results indicate that temperature is an important factor controlling life-history traits of vent shrimps. Fig. 1. Photographs of the larvae of Shinkaicaris leurokolos hatched at 25 °C. (A): larva with shortened abdomen; (B): larva with normal length abdomen and capable of swimming. Scale bar = 500 lm for both larvae. Mitarai. S., McWilliams, J.C., Wave glider observations of surface winds and currents in the core of Typhoon Danas. Geophysical Reseach Letters, doi:10.1002/2016GL071115 (2016). 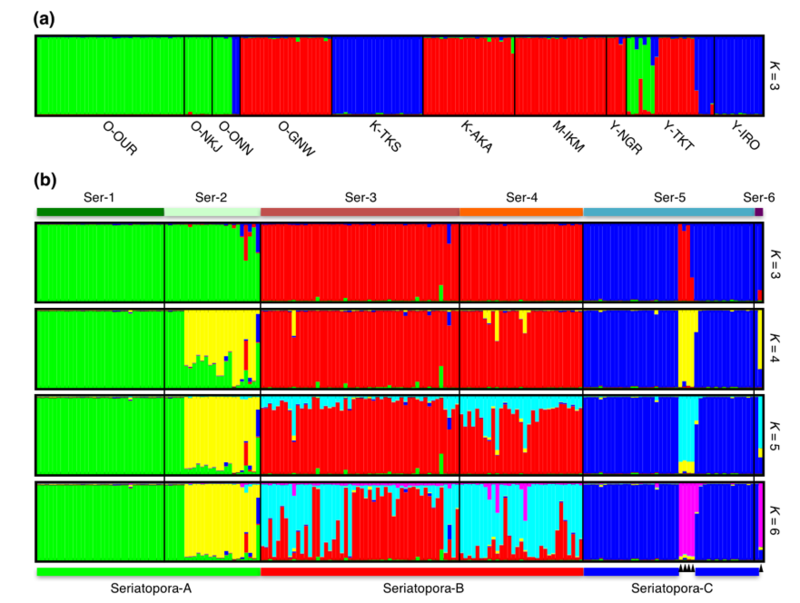 Nakajima, Y., Shinzato, C., Khalturin, M., Nakamura, M., Watanabe, H., Satoh, N., Mitarai, S., The mitochondrial genome sequence of a deep-sea, hydrothermal vent limpet, Lepetodrilus nux, presents a novel vetigastropod gene arrangement. Marine Genomics, doi: 10.1016/j.margen.2016.04.005 (2016). Morgan, S. G., Shanks, Fujimura, A. G., Reniers, Ad J. H. M., MacMahan, J., Griesemer, C.D., Jarvis, M., Brown, J. Surfzone hydrodynamics as a key determinant of spatial variation in rocky intertidal communities. Proceeding of the Royal Society B, doi:10.1098/rspb.2016.1017 (2016). 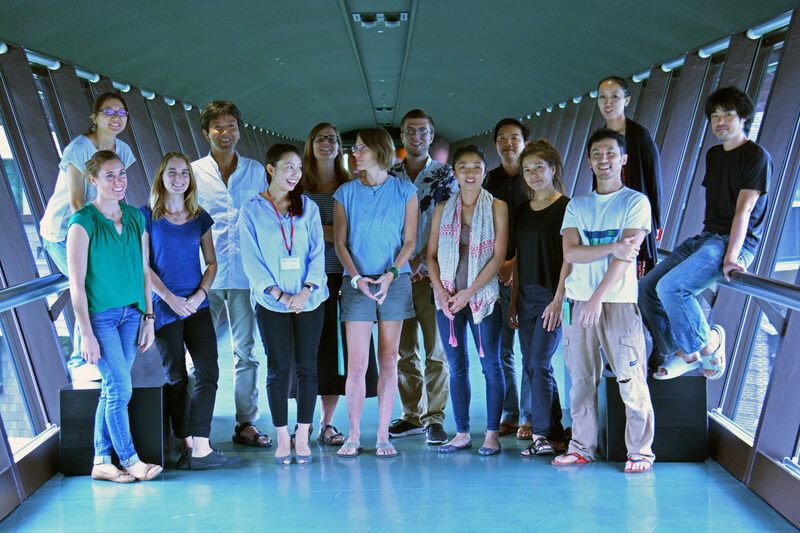 Mitarai, S., Nakajima, Y., Nakamura, M., Nearshore currents and population connectivity around Okinawan fringing reefs - a drifter study, 13th International Coral Reef Symposium, Honolulu, Hawaii, USA. 2016.06.21. Nakajima, Y., Zayasu, Y., Shinzato, C., Wepfer, P. H., Satoh, N., Mitarai, S. Population genetic analysis at various spatial scales of the broadcast-spawning coral, Galaxea fascicularis, in the Nansei Islands, Japan,13th International Coral Reef Symposium, Honolulu, Hawaii, USA. 2016.06.21. Fujimura, A., Mitarai, S. Variability of temperature-induced bleaching within and among coral colonies, 13th International Coral Reef Symposium, Honolulu, Hawaii, USA. 2016.06.22. Thomasm, M. K. Ocean Modeling and Population Connectivity for Mangrove Conservation, Environmental Scientists Network for Asia-Pacific Islands, Okinawa, Japan. 2017.03.21. Mitarai, S. Wave Glider observations of surface winds and currents in the core of Typhoon Danas.Annual Meeting of the Hydrographic and Oceanographic Department, Japan Coast Guard, Tokyo, Japan. 2017.03.08.